While Millennials typically prefer texting, the improvised, back-and-forth pattern we expect of texting conversations differs greatly from the pre-planned, more self-contained messages most professionals expect in the workplace. If you are planning an outing with friends, you expect multiple rapid exchanges asking for clarification and providing corrections on the fly. Since you are usually texting somebody you already know well, about a shared interest, you don’t need to provide much context. A blank subject line suggests that your name in the “From” line is all your recipient should need in order to make you message a top priority. That could come across as arrogant, or at the very least, thoughtless. A well-chosen subject line is an important opportunity to inform and persuade your reader. …write a functional subject line that actually conveys the important idea. Many email users get scads of virus-laden spam with vague titles like this. The more specific you are, the more likely your recipient’s spam-blocker will let your message through. Upon reading this revised, informative subject line, the recipient immediately starts thinking about the size of the room, not about whether it will be worth it to open the email. 2. Keep the message focused. Why are you writing? Are you responding to a request? Apologizing for an error on your part? Asking for the recipient to take some action for you? Purpose: Any textbook on business and professional writing will include examples of complaint and adjustment letters, proposal letters, progress reports, application letters, and so forth. Organization: Readers will often get partway through a complex message, hit “reply” as soon as they have something to contribute, and forget to read the rest. That’s human nature. Split unrelated points into separate, purposeful emails. If you send all your employees a message that only relates to some of them, a lot of people will waste time reading the whole thing, in order to determine whether any part of it applies to them. Politeness: Please and thank-you are still important, but wordiness wastes your reader’s time (which is rude). If you get a message like this, you might assume the sender trusts you and really needs your help; however, if you send a message like this, you might appear needy and panicky. Is that how you want to come across? Think about it. To help your reader focus on your message: keep your text readable. Proofread, especially when your message asks your recipient to do work for you. All-caps comes across as shouting, and no-caps makes you look like a lazy teenager. Regardless of your intention, people will respond accordingly. If you are in middle school, a gushing statement “thx 4 ur help 2day ur gr8!″ may make a busy professional smile — or shudder. Write short paragraphs, separated by blank lines. Most people find unbroken blocks of text boring, or even intimidating. Take the time to format your message for the ease of your reader. Avoid fancy typefaces. Don’t depend upon bold font or large size to add nuances. Your recipient’s email reader may not have all the features that yours does. In a pinch, use asterisks to show *emphasis*. Rather than forcing you reader to download an attachment and open it in a separate program, you will probably get faster results if you just copy-paste the most important part of the document into the body of your message. Subject: Email tips — a subject for an office workshop? don’t always translate correctly for people who read their email on portable devices. Subject: EL227 Absence, Oct 10Hello, Prof. Blinderson. This is Morris Ponsybil, from EL227 section 2.This morning, I just found out that the curling team has advanced to the playoffs, so I’m going to be out of town on the 10th.According to the syllabus, it looks like I will miss a paper workshop and the discussion of Chapter 10. May I email you my Chapter 10 discussion questions before I leave town? And could I come to your office hour at 2pm on the 12th, in order to discuss the paper? I’ve asked Cheryl Jones to take notes for me.Thank you very much. I’ll see you in class tomorrow. If you are asking the other person to do you a favor, providing the right information will give him or her a good reason to decide in your favor. In this case, Morris Ponsybil shows his professor he cares enough about the class to propose a solution to the problem his absence will cause. When contacting someone cold, be polite and brief. If you are asking for a stranger to do something for you for free, be prepared to hear nothing in response. Even if you already have a connection with the person you are contacting, a little context is helpful. Every fall, I get emails from “bad_boy2315@yahoo.com” or “FuZzYkItTy2000@hotmail.com” who ask a question about “class” and don’t sign their real names. While formal phrases such as “Dear Professor Sneedlewood” and “Sincerely Yours,” are unnecessary in email, when contacting someone outside your own organization, you should write a signature line that includes your full name and at least a link to a blog or online profile page (something that does not require your recipient to log in first). If you find yourself writing in anger, save a draft, go get a cup of coffee, and imagine that tomorrow morning someone has taped your email outside your door. Would your associates and friends be shocked by your language or attitude? Will you have to work with this person for several months? Do you want a copy of your bitter screed to surface years from now, when you want a letter of recommendation? When you are writing to a friend or a close colleague, it is OK to use “smilies” :-) , abbreviations (IIRC for “if I recall correctly”, LOL for “laughing out loud,” etc.) and nonstandard punctuation and spelling (like that found in instant messaging or chat rooms). While most people know that email is not private, it is good form to ask the sender before forwarding a personal message. If someone emails you a request, it is perfectly acceptable to forward the request to a person who can help — but forwarding a message in order to ridicule the sender is tacky. Sometimes Email is Too Fast! What I meant to say was “[I] should have looked more carefully at my[list of incoming] email [before replying],” but I could tell from my colleague’s terse reply that she had interpreted it as if I was criticizing her. Surviving Group Projects in College: Helpful Tips. Nudge a slow partner with helpful specifics. Embrace the opportunity to demonstrate your teamwork skills. Thanks for kind useful information. I got some exposure to narrate effective mails. This is very informative and helpful. Nothing looks more unprofessional than an email that looks like a text. another tip would be to avoid putting the recipient(s) email address in until you are ready to send it, this means that it is not possible for you to accidentally send an email to someone before you are ready. Thanks! That’s one of those suggestions that make me ask, “Why didn’t *I think of that???”. I LOVE the example you gave for number 7 on what NOT to do – and how it makes you look if you do. Donald Trump is a good ” horrible warning” of the consequences. Thank you! I used his name in this handout long before he announced himself as a presidential candidate. From the looks of things, Hillary Clinton could also stand to learn a few things about professional email. Email tips are bi-partisan. Keep Going on Dude !! Thank you for the super helpful advice now i can get the help I need by using effective emails. This article is a good way to learn new things. I found your outline of the ‘bad way’, followed by the ‘right way,’ extremely helpful. Thank you! It is actually a great and helpful piece of information. I am satisfied that you simply shared this helpful information with us. Please stay us informed like this. Thanks for sharing this post. First of all, I would like like to thank you for such wonderful tips of effective email writing. The points are explained nicely with lots of examples. The tips shows how an effective professional / unprofessional email may impress the recipient. Need some more in details for a beginners . I found it very info. 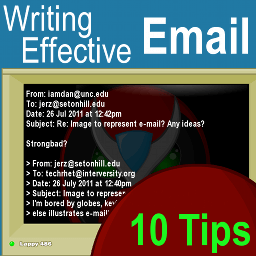 Nice tips and info about Writing Effective Email, thanks for sharing. Thank You for the tips. I loved it. These are quite actionable and will help me a lot. The article is really amazing. keep blogging. we are with you. What you write and the way you write an eMail is equally important for readers, you need to address by introducing yourself, the objective, what you can delivery and how it would benefit the reader/user. I liked the way you have outlined 10 points in this blog. Thank you so much. This article is so thoughtful. Thanks for your tips about effective email writing.